The lucky bidder will be asked for details in relation to the dedication.......... This makes the collection all the more desirable as an idea gift set. When T.C. Campbell and Joseph Steele were found guilty of the horrific murder of the Doyle family in 1984, it concluded a media and police witch-hunt that had begun six months earlier. 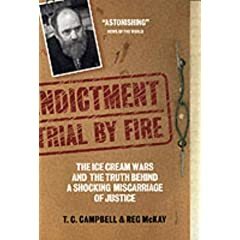 But as Indictment makes abundantly clear, TC Campbell was 'guilty' before the trial even began, the victim of a miscarriage of justice that is all the more chilling because of the manner in which justice was wilfully perverted. Convicted on the flimsiest of hearsay evidence and in one of the darkest episodes in Scottish legal history, T.C. Campbell remains incarcerated and continues to fight for his release. This book, co-authored with acclaimed investigative journalist Reg McKay, documents in disturbing detail the farcical manner in which Campbell and Steele were 'tried' and the ongoing quest by Campbell to exonerate his name.